Apparently, the second 12 lead was after 150 mg of amiodarone. The hilarity is the amiodarone. I received this in an email. It is reported to have been posted on Facebook, but I choose not to have access to Facebook, so I do not have any more details. I am occasionally tempted to set up an account again, but I generally prefer intentional comedy. Everything you need to know is in the first 12 lead. This is a very interesting trial that may surprise the many outspoken amiodarone advocates, but it should not surprise anyone who pays attention to research. There is an excellent discussion of the study on the podcast by Dr. Salim Rezaie and Dr. Anand Swaminathan REBELCast: The PROCAMIO Trial – IV Procainamide vs IV Amiodarone for the Acute Treatment of Stable Wide Complex Tachycardia. One problem with the study that they do not address on the podcast is that the patients in the study appear to have had time to watch Casablanca before treatment started. Here’s looking at you, while we’re waiting, kid. This is apparently unintentional one way of doing a placebo washout. If we wait long enough . . . .
Time from arrival to start of infusion was 87 ± 21 min for procainamide and 115 ± 36 min for amiodarone patients (P = 0.58). If nothing else, this demonstrates how little we need to worry about immediately pushing drugs for stable monomorphic VT (V Tach or Ventricular Tachycardia). Should we expect much from antiarrhythmic treatment? Research shows that for stable monomorphic VT (V Tach or Ventricular Tachycardia) amiodarone is not very likely to be followed by an improvement. Only 29% or only 25% or only 15% within 20 minutes, but if we don’t mind waiting an hour it can be as much as 29%. For those of you who are not good at math, that means amiodarone is about the same as doing nothing, only it comes in a syringe. Even though these poor outcomes ignore the side effects, they are the best evidence in favor of amiodarone, so what Kool-Aid are the advocates drinking? Adenosine, yes adenosine the SVT (SupraVentricular Tachycardia) drug, appears to be more effective at treating ventricular tachycardia than amiodarone – and adenosine is faster and safer than amiodarone. What if the patient becomes unstable? First start an IV (IntraVenous) line. Then sedate the patient. Then apply defibrillator pads. After the patient is adequately sedated, then cardiovert. We do not need the pads on the patient first. If it takes a while to put the pads on, that is a problem with the ability of the doctors and nurses, not a medical problem. It does not appear as if any patient received amiodarone or procainamide until after waiting in the ED (Emergency Department) for over an hour. Were some patients cardioverted in well under an hour? Probably. The important consideration is that the doctors and nurses be able to apply the defibrillator pads properly and quickly and deliver a synchronized cardioversion in less than a minute. If the patient has not yet been sedated, the cardioversion should be delayed until after the patient is adequately sedated, so the intervention that depends most on time is the sedation of the patient. Is there a better treatment than amiodarone? Sedate the patient before the patient becomes unstable, then cardiovert. How do the MACEs (Major Adverse Cardiac Events) compare with sedation and cardioversion vs. antiarrhythmic treatment. Amiodarone may cause a worsening of existing arrhythmias or precipitate a new arrhythmia. Proarrhythmia, primarily torsade de pointes (TdP), has been associated with prolongation, by intravenous amiodarone, of the QTc interval to 500 ms or greater. Although QTc prolongation occurred frequently in patients receiving intravenous amiodarone, TdP or new-onset VF occurred infrequently (less than 2%). Monitor patients for QTc prolongation during infusion with amiodarone. Reserve the combination of amiodarone with other antiarrhythmic therapies that prolong the QTc to patients with life-threatening ventricular arrhythmias who are incompletely responsive to a single agent. All antiarrhythmic drugs can cause arrhythmias. In the absence of information about a specific problem that is best addressed by a specific drug (amiodarone is the opposite of specific), we should avoid treatments that have such a high potential for harm. Amiodarone doesn’t even do a good job of preventing arrhythmias. Intravenous amiodarone did not prevent induction of sustained ventricular tachycardia in any of five patients inducible at baseline. Of six patients with non-sustained ventricular tachycardia, five had sustained ventricular tachycardia or fibrillation induced after amiodarone infusion. Is anything worse than amiodarone? Even epinephrine, yes epinephrine the inadequately tested cardiac arrest drug, has been followed by improved outcomes from V Tach after amiodarone failed. Sedation, search for reversible causes, apply defibrillator pads, and be prepared to cardiovert. Maybe sedation isn’t that important? This is by Dr. Peter Kowey, one of the top cardiologists in the world. As I discovered, the reason for this patient’s terror was that he had been cardioverted in an awake state. Ventricular tachycardia had been relatively slow, he had not lost consciousness, and the physicians, in the heat of the moment, had not administered adequate anesthesia. Although the 5 mg of intravenous diazepam had made him a bit drowsy, he felt the electric current on his chest and remembered the event clearly. The patient’s mental state complicated the case considerably. How unimportant is sedation? How unimportant is consent? For sedation, I would recommend ketamine, but etomidate was recommended in the podcast. Both work quickly and the most important obstacle to immediate treatment of a patient who suddenly deteriorates is the time to effect of sedation. Neither drug is expected to interfere with perfusion, which is the main excuse given for avoiding sedation for cardioversion. This study is very small (not the fault of the authors), but it adds to the evidence that amiodarone is not a good first treatment for the patient. Overall, neither amiodarone nor lidocaine resulted in a significantly higher rate of survival or favorable neurologic outcome than the rate with placebo among patients with out-of-hospital cardiac arrest due to initial shock-refractory ventricular fibrillation or pulseless ventricular tachycardia. The calamity of cardioversion of conscious patients. Am J Cardiol. 1988 May 1;61(13):1106-7. No abstract available. On 1-Union-801 John Broyles and I discussed some things that I had written. I was supposed to be on the podcast two weeks earlier, but I am on duty at the time of the podcast, and I had a call a few minutes before the show. This podcast was not interrupted by any calls. Epinephrine for V Tach – Instant Death or Effective Treatment? What might happen if epinephrine is given for this V Tach (Ventricular Tachycardia)? Click on images to make them larger. Image credit and article about epinephrine for V Tach. We also discuss sychronized cardioversion and procainamide. Do Paralytics Improve Outcomes Following Resuscitation? We want to minimize movement after starting therapeutic hypothermia. Is the use of paralytics the right way to do this? The author appears to take the comments of Dr. David Newman completely out of context in order to make a point that I do not think Dr. Newman would ever make. Dr. David Newman, and sometimes Dr. Ashley Shreves, write and podcast about research and emergency medicine. There is an excellent deconstruction of the ACLS (Advanced Cardiac Life Support) guidelines and the lack of evidence for the drugs recommended in the guidelines. The NNT is another excellent site that is here, too. I also mentioned Dr. Richard Levitan’s No Desat approach of using high flow oxygen by nasal cannula, which works wonders. Read about No Desat! Do we use gloves properly? Is DNA transfer between patients an indication of a lack of use of gloves? Amiodarone is generally considered a class III antiarrhythmic drug, but it possesses electrophysiologic characteristics of all four Vaughan Williams classes. If you use ventilators, do you change all of the settings at once, or do you adjust one at a time? 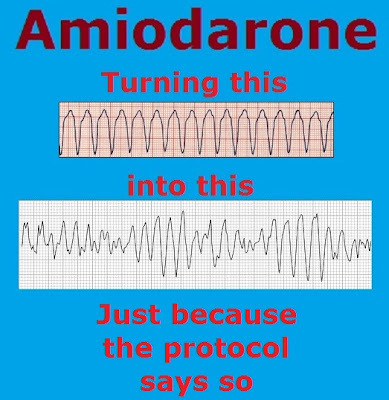 Amiodarone changes all of the conduction at the same time, just not in ways that are as controllable as the settings on a ventilator. Amiodarone is the napalm of antiarrhythmics. Amiodarone hits everything all at once. Amiodarone interferes with all of the Vaughn Williams classes. Some people think that a broad-spectrum antiarrhythmic is somehow a good thing. That might be the case, if there were a reason to believe that the patient is experiencing problems with all 4 of these conduction systems and the amiodarone is going to improve all 4 of these conduction systems. Imagine trying to guess the combination to a very simple 4 digit combination lock. We will make the digits binary, since the choices are more conduction or less conduction. No change is not really a possibility with amiodarone. How would we calculate the odds of reaching the right combination? Each class has only 2 possibilities, so the calculation is 2 X 2 X 2 X 2 = 16. Four different conduction systems being manipulated – all at the same time. But it isn’t even that complicated. We know what the expected direction of effect of the amiodarone will be. The only question is whether the effect of amiodarone makes things better for that class, or if amiodarone makes things worse. This is still a binary consideration, so the calculation does not change. Of course, this is an over-simplification, but Just give amiodarone is also an over-simplification. He’s got an odd rhythm on the ECG. Don’t you want to know what the rhythm is? But what if amiodarone makes things worse? As simple as pointing a diagnostic device and pressing Go or pointing at a drug and grunting. 21st Century Emergency Medical Care. 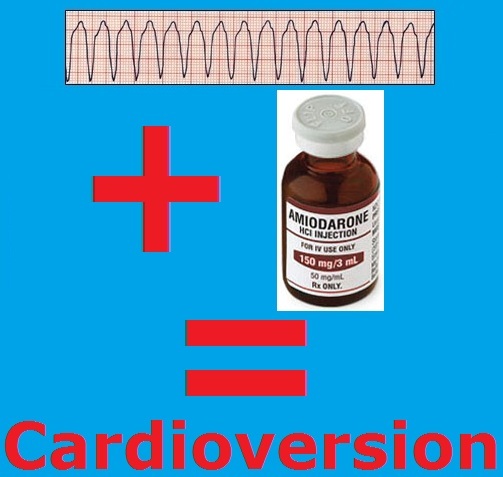 If amiodarone is so good, why do so many patients end up being cardioverted? For monomorphic V Tach – less than 30% success,, – and monomorphic V Tach is what amiodarone is best at. If amiodarone is safe, that may not be a bad idea, but . . . .
Amiodarone I.V. has been reported to produce negative inotropic and vasodilatory effects in animals and humans. In clinical studies of patients with refractory VF or hemodynamically unstable VT, treatment-emergent, drug-related hypotension occurred in 288 of 1836 patients (16%) treated with amiodarone I.V. No correlations were seen between the baseline ejection fraction and the occurrence of clinically significant hypotension during infusion of amiodarone I.V. Isn’t hypotension one of the things we are trying to avoid? Less than 30% improve, but 16% get worse? Maybe that is why the FDA (Food and Drug Administration) label only says that we should be using amiodarone after other treatments do not work. Amiodarone HCI Injection is indicated for initiation of treatment and prophylaxis of frequently recurring ventricular fibrillation and hemodynamically unstable ventricular tachycardia in patients refractory to other therapy. Amiodarone may not be a good starting point for treatment, but more of a last ditch – It can’t possibly get any worse, so what has the patient got to lose? treatment. In Dr. Orman’s podcast – V Tach Storm – hemodynamically unstable is where the patient ended up after amiodarone. The patient’s heart rate is 207, but he is hypertensive. 150 mg of amiodarone is reported to have been given over 5 to 10 minutes, even though ACLS and the FDA label state that the initial dose should be given over 10 minutes. He later repeats the dose of amiodarone and adds 2 gm magnesium. A couple of sinus beats emerged, but went away, but now his heart rate is over 220. The patient becomes hypotensive – from 175 systolic to 90/55 and he became short of breath. Is it the amiodarone, or the magnesium, or the rhythm, or something else, or some combination of these? Then he appears to have been given some propofol for sedation and cardioverted at 200 joules, then 300 joules, then 360 joules. The doctor feels the need to apologize for repeating cardioversion, which I don’t understand. Why not sedate and cardiovert earlier? My experience has been that cardioversion is frequently done incorrectly. That is one of the reasons I would spend a lot of time on cardioversion in ACLS classes. The ACLS procedures most commonly fouled uo are cardioversion, transcutaneous pacing, needle decompression of tension pneumothorax, and needle decompression of cardiac tamponade. Not many people are comfortable cardioverting patients. Eventually, the cardiologist gave another 150 mg of amiodarone and 5 mg of metoprolol and soon after the arrhythmia changed to a 50/50 mix of sinus tachycardia and V Tach. A stable 75 year old patient with V Tach at a rate of almost 200. An unknown dose of disopyramide (Norpace), 135 mg lidocaine, cardioversion X 4, 150 mg amiodarone, 2 gm magnesium, 150 mg amiodarone, an unknown dose of propofol, cardioversion X 3, 150 mg amiodarone, and 5 mg metoprolol. After deterioration, he improves to an alternating V Tach and sinus tachycardia with each present about half of the time. How much did the drugs help? How much did the drugs hurt? Procainamide was not given. Sotalol was given in the ICU. The patient was taking disopyramide (Norpace), which is mentioned as being proarrhythmic, but lidocaine is proarrhythmic. Amiodarone is proarrhythmic. Why are the proarrhythmic effects of these drugs not also mentioned? When do we stop throwing proarrhythmic medications at a rhythm? At the end, there is a good discussion of other possible treatments, which you should listen to. V Tach Storm. Like class I drugs, amiodarone blocks sodium channels at rapid pacing frequencies, and like class II drugs, it exerts a noncompetitive antisympathetic action. One of its main effects, with prolonged administration, is to lengthen the cardiac action potential, a class III effect. The negative chronotropic effect of amiodarone in nodal tissues is similar to the effect of class IV drugs. In addition to blocking sodium channels, amiodarone blocks myocardial potassium channels, which contributes to slowing of conduction and prolongation of refractoriness. The antisympathetic action and the block of calcium and potassium channels are responsible for the negative dromotropic effects on the sinus node and for the slowing of conduction and prolongation of refractoriness in the atrioventricular (AV) node. Its vasodilatory action can decrease cardiac workload and consequently myocardial oxygen consumption. Here is a list of the possibilities, for those wanting to see the math. 1. Better – Better – Better – Better. 2. Better – Better – Better – Worse. 3. Better – Better – Worse – Better. 4. Better – Worse – Better – Better. 5. Worse – Better – Better – Better. 6. Better – Better – Worse – Worse. 7. Better – Worse – Better – Worse. 8. Worse – Better – Better – Worse. 9. Better – Worse – Worse – Better. 10. Worse – Better – Worse – Better. 11. Worse – Worse – Better – Better. 12. Better – Worse – Worse – Worse. 13. Worse – Better – Worse – Worse. 14. Worse – Worse – Better – Worse. 15. Worse – Worse – Worse – Better. 16. Worse – Worse – Worse – Worse. In the comments to Is Amiodarone the Best Drug for Stable Ventricular Tachycardia is the following from Doc Cottle of Mill Hill Ave Command. Unfortunately, I would not be on the receiving end of that comment, for age or procainamide. My adult wide complex tachycardia protocol does not include procainamide. My pediatric wide complex tachycardia protocol does include procainamide. Go figure. It would be nice to have an antiarrhythmic that is significantly more effective than placebo. I do not think that we have good evidence that amiodarone, or lidocaine, is really any better than placebo. Less than 30% effective at terminating stable monomorphic V Tach (VT or Ventricular Tachycardia) does not exactly suggest effective. Causing hypotension, bradycardia, torsades, and other arrhythmias does not exactly suggest safe. Well, stick around long enough, and the passe becomes hip again. V Tach Storm is an important podcast, but I have a few problems with what is covered. What do we do when we run out of algorithm? I don’t think that should be the question. I think that we have become too protocol driven, but that is part of what Dr. Orman describes. The question is Why is the patient experiencing this arrhythmia? We can get rid of arrhythmias without addressing the underlying cause. With some treatments, we exacerbate the underlying cause. What was done for/to the patient? PS – The age is cut off at the beginning of the podcast. The patient is 75 years old. EMS initially gave lidocaine, then shocked him without any sedation, even though he had stable vital signs and should have been given sedation. Even if the patient hypotension, ketamine would have been a good sedative, but few of us in EMS have ketamine. Shocked four times without sedation. Then, amiodarone was given, even though amiodarone is not a drug that consistently produces good outcomes. For a baseball player, a batting average of .290 is not bad. For a drug, .290 is only good if there are no better alternatives and the drug is safe. Studies show that amiodarone is only 29% effective at terminating V Tach, only 25% effective at terminating V Tach, , and only 15% effective at terminating V Tach within 20 minutes, but if we don’t mind waiting an hour it can be as much as 29% effective. If we are not trying to convert the rhythm promptly, should we even consider V Tach an emergency? If lights and sirens only make a difference of a minute, or two, V Tach is obviously not a lights and sirens emergency. Maybe we need a treatment that works. At least amiodarone doesn’t cause arrhythmias. Right? Of 6 patients with non-sustained V Tach, 5 of them developed sustained V Tach or developed V Fib (Ventricular Fibrillation). In what way does amiodarone seem like a good idea? As long as we don’t mind causing hypotension, causing bradycardia, converting non-sustained V Tach to sustained V Tach, causing torsades, and causing V Fib. We wouldn’t hold those really bad things against amiodarone. Continuing with the answer to Where are the Black Box Warnings on These Drugs – I. There is a black box warning on droperidol for prolonging the QT segment, but there is no black box warning for this commonly used EMS drug (Drug X) that also prolongs the QT segment. Are we supposed to think that Drug X is safer than droperidol? Like all antiarrhythmic agents, amiodarone I.V. may cause a worsening of existing arrhythmias or precipitate a new arrhythmia. Proarrhythmia, primarily torsades de pointes (TdP), has been associated with prolongation by amiodarone I.V. of the QTc interval to 500 ms or greater. Although QTc prolongation occurred frequently in patients receiving amiodarone I.V., torsades de pointes or new-onset VF occurred infrequently (less than 2%). Patients should be monitored for QTc prolongation during infusion with amiodarone I.V. Combination of amiodarone with other antiarrhythmic therapy that prolongs the QTc should be reserved for patients with life-threatening ventricular arrhythmias who are incompletely responsive to a single agent. Have you ever been warned about the possibility of inducing torsades de pointes or new-onset VF with amiodarone? What is the incidence of torsades de pointes or new-onset VF with droperidol? Much much less than 2%. Although QTc prolongation occurred frequently in patients receiving amiodarone I.V., torsades de pointes or new-onset VF occurred infrequently (less than 2%). Patients should be monitored for QTc prolongation during infusion with amiodarone I.V. Where is the black box warning for amiodarone for more frequent torsades and VF? Maybe you have not seen torsades even with semi-frequent administration of amiodarone. How many people have seen torsades even with more frequent administration of droperidol? Patients with hypokalemia or hypomagnesemia should have the condition corrected whenever possible before being treated with amiodarone I.V., as these disorders can exaggerate the degree of QTc prolongation and increase the potential for TdP. Special attention should be given to electrolyte and acid-base balance in patients experiencing severe or prolonged diarrhea or in patients receiving concomitant diuretics. Have you ever been warned to avoid giving amiodarone to hypokalemic or hypomagnesemic patients? In EMS, other than guessing based on the patient’s history, how would we know that the patient has hypokalemia or hypomagnesemia? In the ED (Emergency Department), are magnesium or potassium levels checked before giving amiodarone? Why does droperidol have a black box warning? Amiodarone is associated with more frequent torsades and VF than droperidol. We give out amiodarone more often than banks give political donations. Why doesn’t amiodarone have a black box warning? In my last post, Not Successful Resuscitation, I mentioned the potentially reversible causes of cardiac arrest. First a definition. These are conditions that can lead to sudden death as well as a more gradual death. In the case of a more gradual death, their potential for reversibility dramatically decreases. One of the reasons is that these conditions, conditions bad enough to kill you, can cause significant organ damage when they are present for an extended period. Acidosis is very destructive to the body, but if it is a sudden change, rather than a long term condition (especially one that is not responding to aggressive medical treatment), then reversing the acidosis may help to resuscitate the patient. There are many factors that affect the ability to resuscitate a patient. As I mentioned, a gradual onset is not as easy to reverse. A gradual onset is because the illness is a chronic condition or a progressive condition. But if it is a progressive condition, that has progressed to death, how can it be a reversible cause of cardiac arrest? The potentially reversible causes tend to be sudden. That does not mean that a gradual onset rules out resuscitation, just that it becomes much more difficult to resuscitate these patients, and much more difficult to keep these patients alive if we do manage to resuscitate them. These causes tend to be overwhelming to the body. Still, a sudden onset of a potentially reversible cause of cardiac arrest may not respond to treatment, even if the patient is in the ideal treatment setting, because these causes are only potentially reversible. Then why spend so much time on them? All of resuscitation is about potentially reversible causes. VF/Pulseless VT (Ventricular Fibrillation/Pulseless Ventricular Tachycardia) are the easiest to reverse, the most likely to be reversed, and the easiest to diagnose. Of course you can. You just can’t legally claim that you are diagnosing. This is purely a legal distinction. It has no basis in reality. Arrhythmia – shocking a shockable rhythm. Some of the arrhythmias that can cause cardiac arrest may be reversed by defibrillation. Some of the arrhythmias that can cause cardiac arrest will not improve with defibrillation. Asystole is an excellent example of an arrhythmia that will not respond to defibrillation. Asystole is caused by defibrillation. We shock patients because we want to cause asystole – temporarily. The defibrillation is designed to send enough current through the heart to stop the heart for less than a second. The purpose of defibrillation is to get rid of the dangerous rhythm that is controlling the heart, whether it is an organized rhythm, such as VT or SVT (SupraVentricular Tachycardia), or disorganized activity, such as VF. After the shock is delivered, and some asystole is produced, it is hoped that the heart starts again on its own and when the heart starts again, it is hoped that the sinus node will be controlling the rate and rhythm. If the patient’s normal pacemaker is not the sinus node (a couple of examples are atrial fibrillation or an implanted pacemaker), then the hope is that the normal pacemaker resumes its role of initiating a rhythm capable of keeping the patient alive. In western movies, during a big bar fight, the sheriff may fire a gun into the air. Everyone tends to stop, at least long enough to make sure the gun is not pointed at them. This pause in the commotion is what defibrillation is supposed to accomplish. The sheriff is telling the arrhythmia to move along. 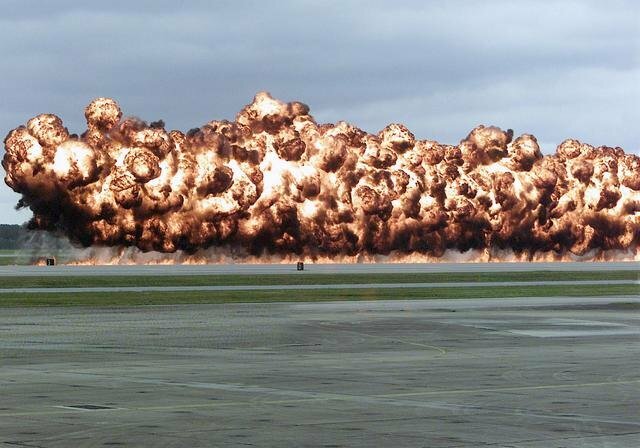 As in the movies, it does not always work as planned. If the arrhythmia/chaos does not go away with defibrillation, more defibrillation may be attempted. Even if the ceiling is shot full of defibrillations, there is no maximum number of defibrillations, as long as the patient is in a shockable rhythm. Antiarrhythmic medications may be added to the treatment (after some epinephrine, the most arrhythmogenic drug we use). The search for other potentially reversible causes of cardiac arrest will contribute to treatment. Something that causes arrhythmias. I describe problems with the use of epinephrine in Epinephrine in Cardiac Arrest, More on Epinephrine in Cardiac Arrest, and Dead VT vs Not Quite Dead, Yet VT.
What if the asystole is not temporary? This is not unusual. The current ACLS (Advanced Cardiac Life Support) algorithms are pretty easy to use. If you are using an algorithm that no longer applies, you should switch to the algorithm that does apply. I will cover asystole in another post. Are there any other rhythms that should be defibrillated? SVT – if the patient is pulseless. Any rhythm that would be cardioverted, if the patient were alive, should be defibrillated if the rhythm is bad enough to produce a dead patient. Although this falls into the category of PEA (Pulseless Electrical Activity), it is a shockable rhythm and will respond best to defibrillation. One of the perversions of the algorithms is that they spend almost no time on Postresuscitation Support. There is no algorithm, flow sheet, or other easy to use chart. The 2010 ACLS Guidelines added an easy to use algorithm. This is the AHA (American Heart Association), in the 2000 guidelines they were not discouraged by the possibility of an overly dense, extremely confusing 3 page tachycardia algorithm “overview” flow sheet. Pages 1, 2, and 3, followed by the individual pages for specific tachyarrhythmias. Fortunately they did learn from that, but there is still no algorithm to ease recall of postresuscitation care – something that is not well understood. That will be more than another post. There are methods of determining if the arrest is one that may be reversed by treatment. Again, this is something for another post. Hypovolemia; Hypoxia; Hydrogen ion (Acidosis); Hypo/Hyperkalemia; Hypoglycemia; Hypothermia. I have changed this from what I originally wrote. My, borrowed from Jeff B of JB on the Rocks, mnemonic (memory aid) for the potentially reversible causes of cardiac arrest is now two words – COLD PATCHeD. COLD reminds you that the C is for hypothermia – being very cold, sometimes we forget the obvious in resuscitation attempts, so it doesn’t hurt to put extra reminders in a mnemonic. O for Oxygen deficit or hypoxia. L for Lytes. This works better as a mnemonic for the in hospital crowd, but there is nothing wrong with getting EMS to think more about electroLytes. Hypokalemia and Hyperkalemia – too little and too much potassium. D for Drugs (OverDose, poison, wrong drug, wrong dose, . . .). PATCHeD = P – PE (Pulmonary Embolus); A – Acidosis and AMI (Acute Myocardial Infarction); T – Tension Pneumothorax; C – Cardiac Tamponade; H – Here it is still confusing, a whole bunch of Hypo’s and one Hyper. The Hypo’s: HypoVolemia; HypoThermia; HypoGlycemia; HypOxia; HypoKalemia; The Hyper: HyperKalemia; e – Everybody dead gets Epi. Just a reminder to continue CPR and other treatments. D – Drugs (OD, poison, wrong drug, wrong dose, . . .); Distributive Shock. I will have to write a post on why each of these categories matter, what the treatments are, and other ways to approach them, rather than the order of the mnemonic. This is a lot for one post. 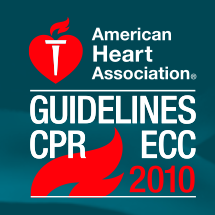 Footnotes were added 5/11/2011 to include links to 2010 ACLS guidelines. Links were also updated.